Cardiac myxomas (CMs) account for nearly half of the primary cardiac tumors in the elderly. They arise from sub-endocardial "reserve" or "lepidic" cells, which may show divergent differentiation. We describe a CM with glandular differentiation in the right atrium of a 10-year-old child who presented with respiratory distress on exertion, of 2 months duration. On echocardiography, two large interconnected masses measuring 34Χ30 mm and 20Χ17 mm were seen to arise from the free wall of the right atrium. Cut surface of the excised mass was myxoid with areas of calcification. On microscopy, there were typical features of a myxoma with prominent glandular differentiation and characteristic immunophenotype. The case is being reported due to its rarity in pediatric age group as well as its glandular differentiation, which must be recognized as a spectrum of histomorphologic diversity and must not be mistaken for a metastatic adenocarcinoma. Primary tumors of the heart are rare, with a reported incidence in the range of 0.0017-0.33% in autopsy series, amongst which cardiac myxoma (CM) is the commonest. It commonly occurs in females during third to fifth decade and is rare in pediatric population, in whom it has been reported to occur only up to 7%. Most (75%) of the myxomas arise from the left atrium near the fossa ovalis of inter-arterial septum, while the others arise within the right atrium. Majority of them present sporadically; however, they can present with Carney's complex. In general, myxomas are mesenchymal in origin. Glandular differentiation in a myxoma is rare and has been occasionally reported in association with Carney's complex. ,, We present a case of myxoma showing glandular differentiation arising in the right atrium in a child, with a detailed histochemical and immunohistochemical analysis. A 10-year-old boy presented with gradually progressing respiratory distress on exertion, of 2 months duration. A two-dimensional echocardiography showed two large interconnected masses measuring 34Χ30 mm and 20Χ17 mm, attached to the free wall of right atrium close to inferior vena cava. The lesion was surgically resected and sent for histopathologic examination. There was no similar or related diseases noted in the family. Grossly, the tumor comprised two well-circumscribed unencapsulated globular soft tissue masses which were interconnected by a short pedicle. The tumor was 60Χ40Χ30 mm in dimension. Cut surface of the tumor was gray-white and had gelatinous and calcified areas [Figure 1]. Hematoxylin and eosin stained slides (H and E) showed a hypocellular tumor comprising stellate or lepidic cells in a myxomatous background, showing evidence of old hemorrhage and minimal fibrosis. These cells had scant to moderate amount of eosinophilic cytoplasm and elongated to star shaped nuclei. A few thin- as well as thick-walled blood vessels were also identified. The blood vessels in some areas showed subendothelial myointimal proliferation, surrounded by mucin lakes. Glandular structures were lined by cuboidal to tall columnar cells interspersed with mucin droplets and thin basophilic secretions in the lumen. Some of these glands were seen floating inside a pool of mucin. Focal conglomeration and back to back arrangement of the glands with formation of cribriform structures were noted. The lepidic cells were found evenly distributed, whereas the glandular component was confined to the pedicle of the tumor [Figure 2]a and b.
Alcian blue-periodic acid Schiff (AB-PAS) and mucicarmine staining was performed in the representative sections. There were large pools of extracellular mucin positive for both PAS and AB stains at pH 2.5, indicating its acidic nature. The glandular epithelium showed basal positivity for PAS and apical positivity for AB. Mucicarmine stain positivity correlated with the pattern of positivity of AB [Figure 2]c and d [Table 1]. Immunohistochemical stains for pan-cytokeratin (CK) (Dako, Denmark; 1:100), CK-7 (Dako, Denmark; 1:100), CK-20 (BioGenex, CA, USA; 1:50), carcino-embryonic antigen (CEA) (BioGenex, CA, USA; 1:100), vimentin (DBS, CA, USA; 1:100), S-100 protein (Dako, Denmark; 1:800), calretinin (BIO SB, CA, USA;1:100), desmin (Biocare, CA, USA; 1:50) and epithelial membrane antigen (EMA) (Dako, Denmark; 1:100) were performed on representative sections after antigen retrieval. Vimentin, EMA, pan-CK, CK-7, CEA and calretinin were positive in the glandular structures and variably in stellate cells and blood vessels [Figure 2]e-i. 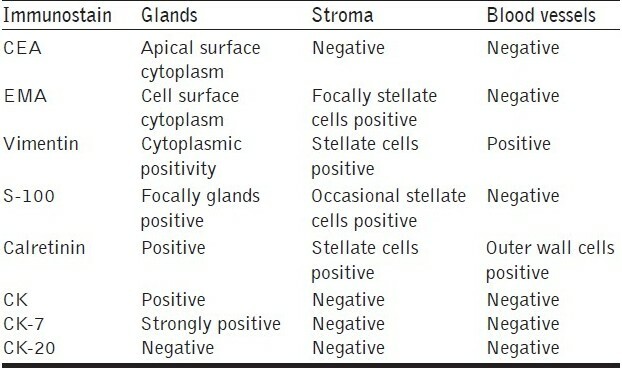 Desmin was focally positive in the stellate cells and blood vessels [Table 2]. Though first described in 1845, epithelial differentiation in a myxoma was reported after a long period in 1946 by Anderson et al. Though myxomas have been reported in children aged as early as 1 month,  to the best of our knowledge, a right atrial myxoma with glandular differentiation has not been reported in children and the index case represents the first documentation of the same. Atrial myxoma in younger patients is commonly associated with familial syndromes as Carney's complex with frequent tumor recurrence, more gelatinous appearance and little fibrosis. In the index case, the other features of a familial link such as spotty pigmentation, endocrine abnormalities or myxoid neurofibromas were not identified. On histologic examination, abundant extracellular and peri-vascular acidic mucin was identified with minimal fibrosis, indicating the probability that fibrosis in a myxoma is related to the chronicity of the disease. 1) Divergent differentiation of sub-endocardial lepidic cells, 2) the possibility of entrapped foregut rests or 3) progressive differentiation of myxoma into glands. Initially, myxoma was also considered as an organizing thrombus rather than a tumor; however, now it has been accepted as a neoplasm. 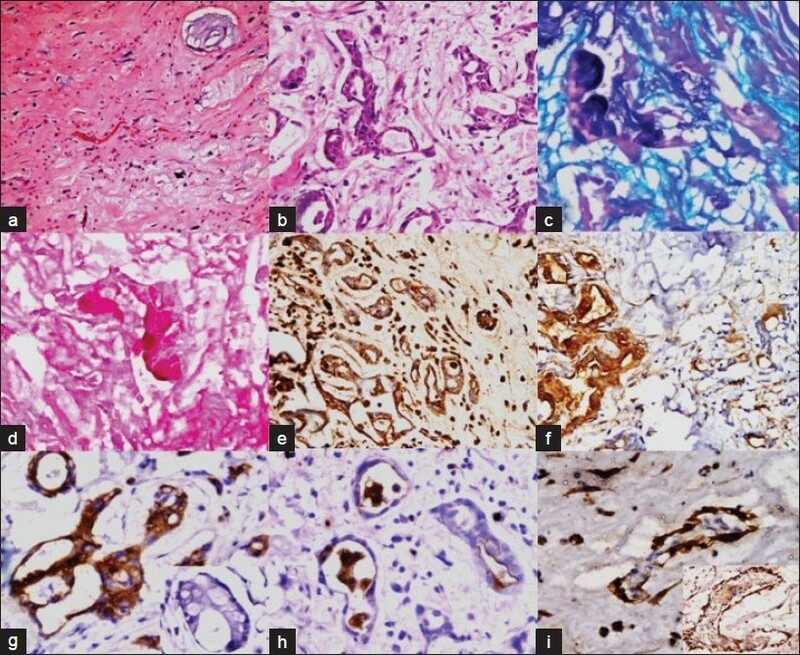 The histochemical and immunohistochemical profile of this tumor, as seen in the index case or of those reported in literature, shows that there is positivity for both mesenchymal and epithelial differentiation, indicating that the primitive reserve cells are the possible source. In the index case, pan CK and CK-7 were strongly positive along with EMA and CEA, whereas CK-20 was negative in the glandular structures, indicating a possibility of entrapped foregut rest origin of this tumor. Such a link was also identified by Pucci et al. The tumor components also showed clear positivity for calretinin, while in the above mentioned report the authors failed to demonstrate a mesothelial link. In a mesothelioma, all the above mentioned markers can be positive; however, they are rarely positive for mucicarmine. Hence, stating that myxomas arise from mesothelial rests, is also not out of controversy. It can further be argued if myxomas are a part of teratoma or not; absence of squamous islands or any other mesenchymal elements rule out this possibility. In a report by Linder et al., the authors described such myxomas as "congenital endodermal heterotopia of the AV node," based on the positivity for PAS-D and CEA;  however, this hypothesis does not hold true due to absence of any other element. Hence, though it is apparent that these glandular structures are footprints of the divergent differentiation of reserve cells, from the histochemical and immunohistochemical pattern we cannot prove or disprove any of these hypotheses. Pucci et al ., in their case series, elegantly tabulated around 28 reports of atrial myxomas with glandular differentiation in adults. However, none of these reported cases was noted in a child. Glandular differentiation in a CM, though rare, is a possible morphologic diversity arising out of intracardiac endodermal heterotopia or represents entrapped foregut rests. This morphologic diversity is extremely rare in pediatric age group. It is important to recognize this entity, as failure to do so may lead to an erroneous diagnosis of metastasis from a mucin secreting adenocarcinoma in the atrium. We express our sincere acknowledgements to the Department of Pathology, AIIMS, and Professor S K Panda, for letting us use the departmental facilities. PD is grateful to CSIR, India, for providing research fellowship of CSIR. 1. Tumors and tumor like lesions of the heart and great vessels. In: Vimani R, Farb A, Burke A, Atkinson JB, Editors. Cardiovascular Pathol. 2 nd ed. Chapter 12. Philadelphia: WB Saunders Company; 2001. p. 424-64. 2. Thornton CM, Walsh MY. Glandular differentiation in cardiac myxomata. Ir J Med Sci 1993;162:95-7. 3. Goldman BI, Frydman C, Harpaz N, Ryan SF, Loiterman D. Glandular cardiac myxomas. Cancer 1987;59:1767-75. 4. Chopra P, Ray R, Singh MK, Venugopal P. Cardiac myxoma with glandular elements: A Histologic, histochemical and immunohistochemical evaluation. Indian Heart J 2003;55:182-4. 5. Meng BY, Wang T, Zhang Q, Ma C, Pan XL, Peng L. Cardiac myxoma in children: report of three cases. Zhongguo Dang Dai Er Ke Za Zhi 2009;11:82. 6. Pucci A, Bartoloni G, Tessitore E, Carney JA, Papotti M. Cytokeratin profile and neuroendocrine cells in the glandular component of cardiac myxoma. Virchows Arch 2003;443:618-24. 7. Linder J, Shelburne JD, Sorge JP, Whalen RE, Hackel DB. Congenital endodermal heterotopia of the atrioventricular node: Evidence for the endodermal origin of so called mesotheliomas of the atrioventricular node. Hum Pathol 1985;110:736-9.